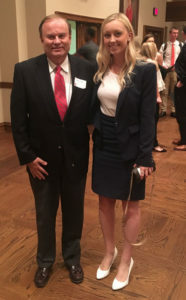 TEI-OKC Chapter president Steven D. Crall (left) poses with the Chapter’s first scholarship recipient, Rachael Murphy, University of Oklahoma. 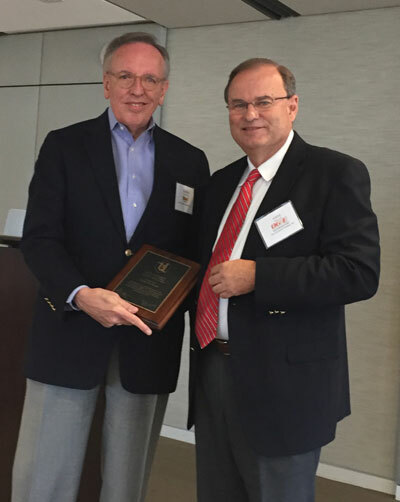 Charles Woods (left) receives the Meritorious Chapter Service Award from TEI-OKC Chapter president Steven D. Crall. TEI’s Oklahoma City Chapter (TEI-OKC) recently began a scholarship program and awarded its first scholarship to Rachael Murphy of the University of Oklahoma on September 13, 2017. Rachael will graduate in May 2019 with a B.B.A/M.Acc., with an emphasis in taxation. She currently interns with KPMG’s tax practice. The Chapter also presented Charles Woods with the Meritorious Chapter Service Award, which recognizes and expresses the Institute’s appreciation for outstanding service to TEI at the chapter level in areas related to the Institute’s advocacy, education, networking, and association management service. A TEI member since 1994, Charles has been a member of the Tulsa and Oklahoma City Chapters and was a major driving force in forming the Oklahoma City Chapter in 2011. For the first three-plus years of the Chapter’s existence, Charles was its president and chapter advisor.